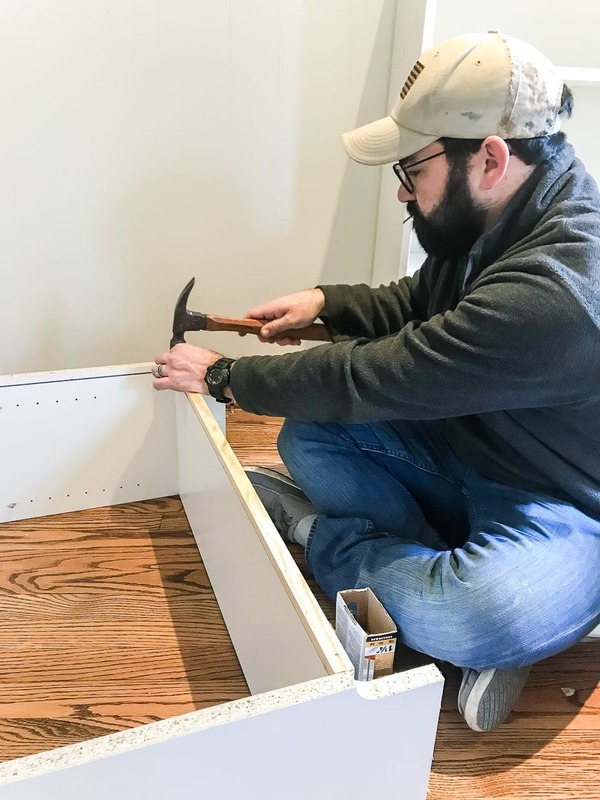 An easy to follow step-by-step tutorial showing how to build bookcase built-ins using IKEA Billy bookcases. Robert and I are at that point of the playroom makeover marathon where we can almost see the finish line. Last week, we painted the yellow walls Benjamin Moore Swiss Coffee, the beige trim Benjamin Moore Simply White, and the beige doors Benjamin Moore Wrought Iron to connect the neutrals and contrast from our living room to this space. To set out on the whole “function” goal in this space though, we needed a whole mess of storage, built-in bookcases to be exact. And voila! Here’s where we are so far. I put down the rug and leaned our DIY Storybook Art on top for now just to get a feel for how it’ll come together. It’s going to be aaaaa-dorable! 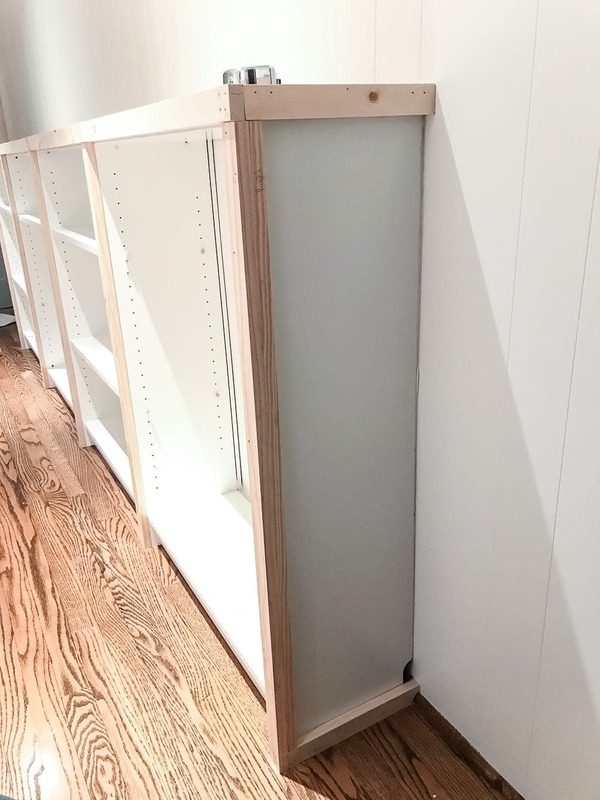 Since we built giant DIY bookcase built-ins using IKEA Billy bookcases in the playroom of the last house, we wanted to continue a similar smaller-scale concept in here so Olivia can more easily sort and we can get a handle on toy organization. For us, since we already had the tools, we paid $304.43 for the wood, bookcases, stain, caulk, polycrylic, and paint total. 1. 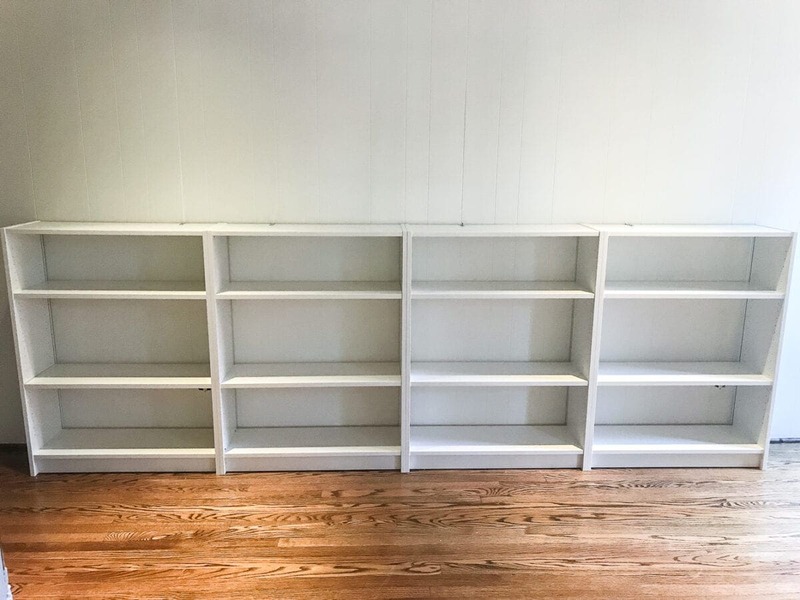 We started out by following the IKEA directions to build the 4 Billy bookcases (which I got for $39 each during IKEA’s winter sale). We chose to keep the backing off that comes with the bookcases so that we could still access our outlets and get rid of that flimsy cardboard piece. 2. 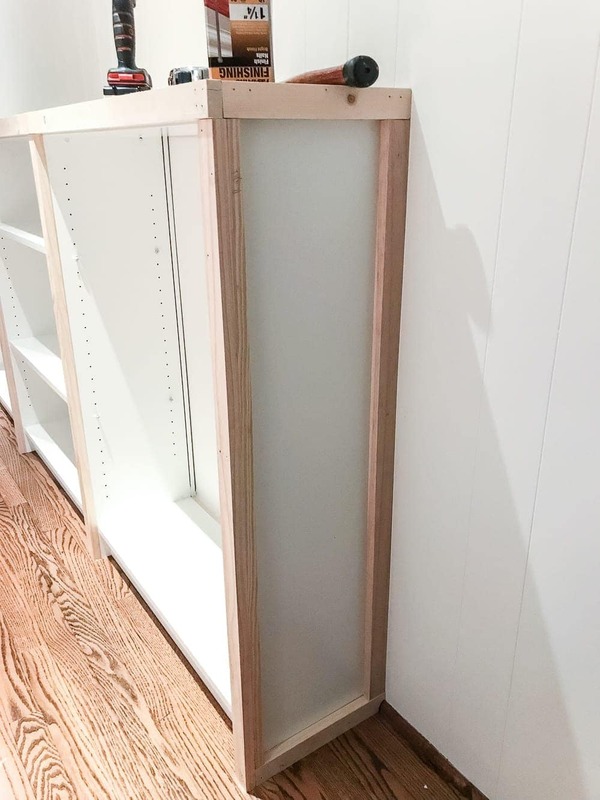 To close up the gap between the bottom shelf and the wall by not using the backing, we nailed a 1″ square dowel to the back of the bottom shelf to all 4 bookcases. 3. Then, we put them against the wall to find the placements we wanted and find the center of the wall to start anchoring. 4. To make all four bookcases one solid piece, we attached the sides together with wood screws at the top and bottom. 5. 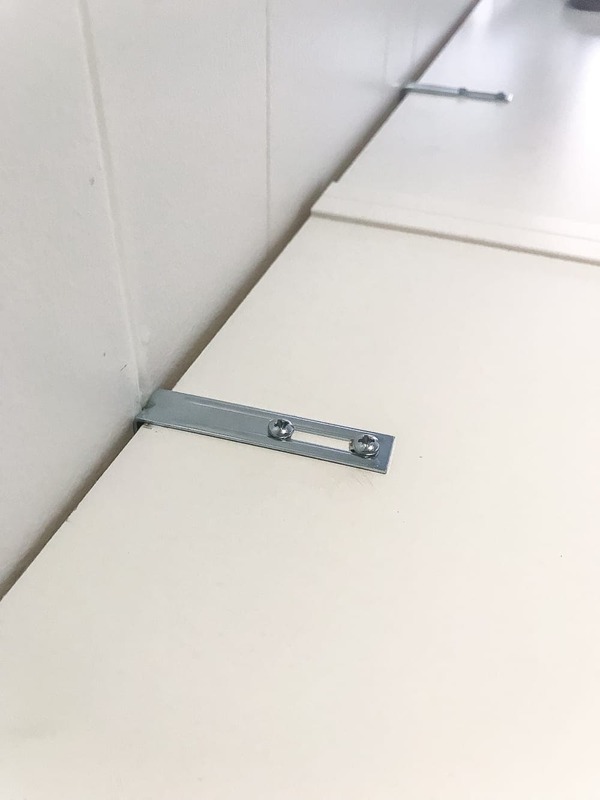 Using the anchors provided in the IKEA bookcases boxes, we attached all of them to the studs in the wall at the top of the bookcases. Then, they were ready to trick out with wood. 5. 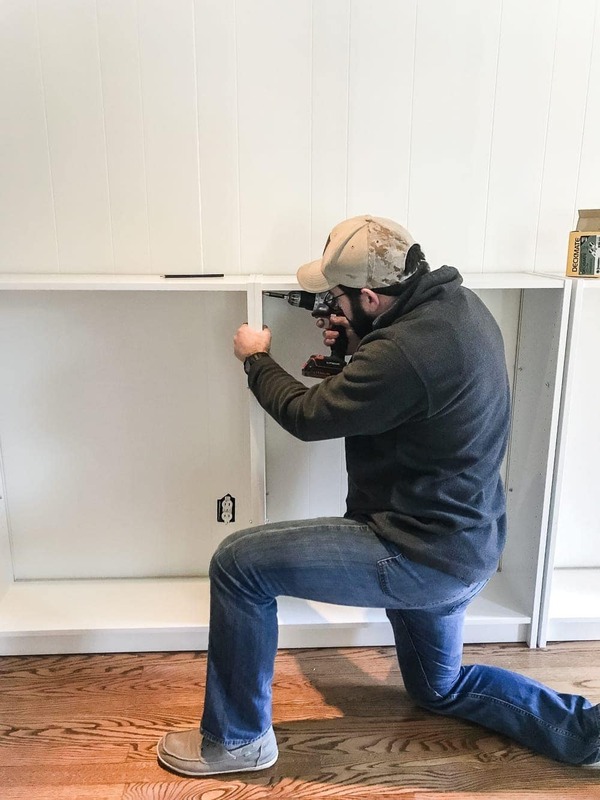 To start making them actual built-ins, we placed the 1″x12″ board on top to mark with the square tool where we would need to cut it with the circular saw. 6. 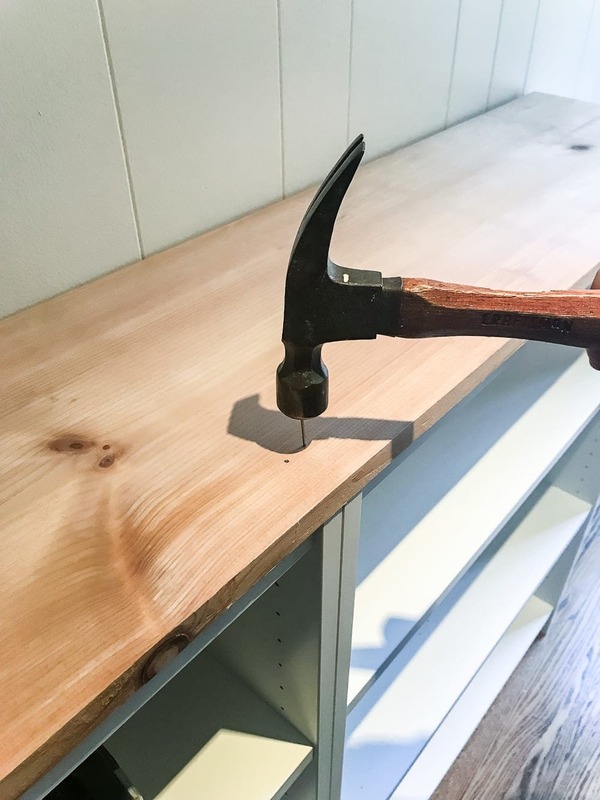 After we cut the 1″x12″ board, we secured it with a little Liquid Nails between the bottom of the board and top of the bookshelf, and we drove finishing nails through the top at each bookcase end. 7. 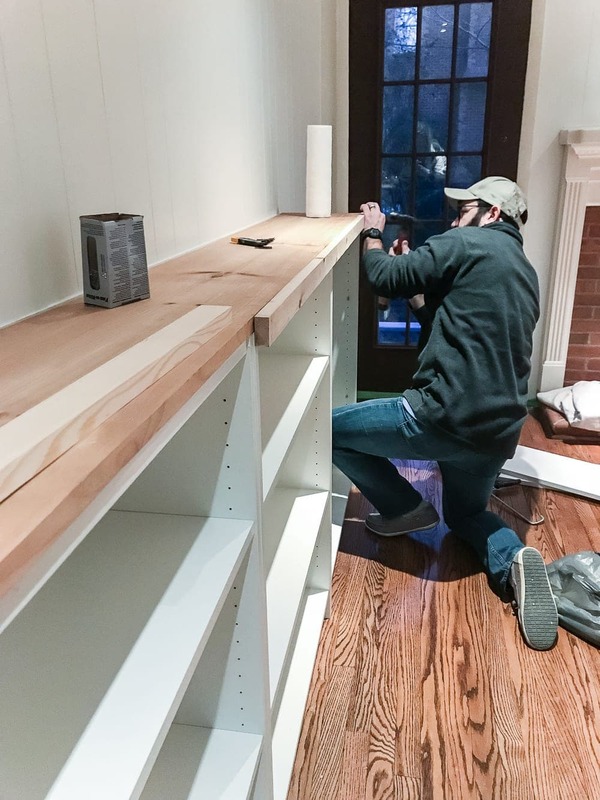 We wanted to make the top look like a finished piece rather than just a plank of wood, so we cut and nailed 1″x2″ boards to the front, leaving an inch overhang on each end of the 1″x12″. 8. 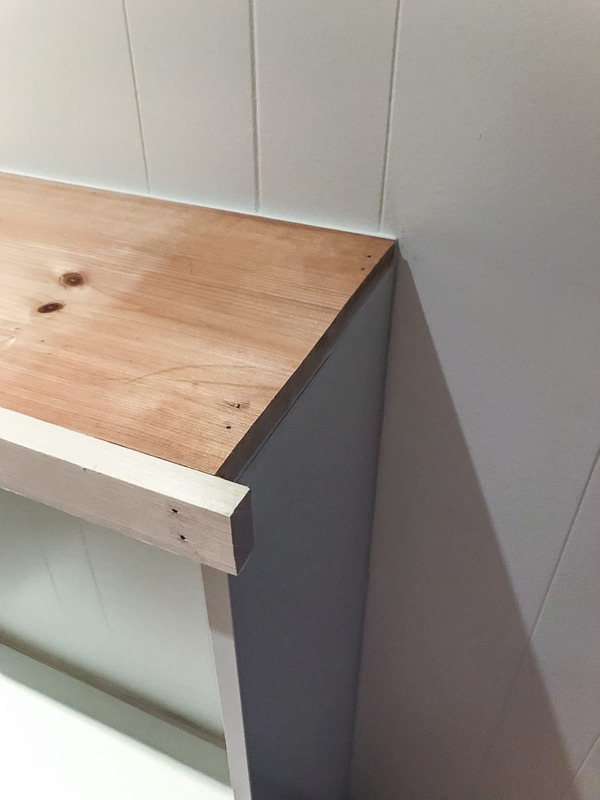 Once the front 1″x2″ boards are attached, measure and cut another 1″x2″ to fit between the front 1″x2″ and the wall to create the corner and side of the top. 9. 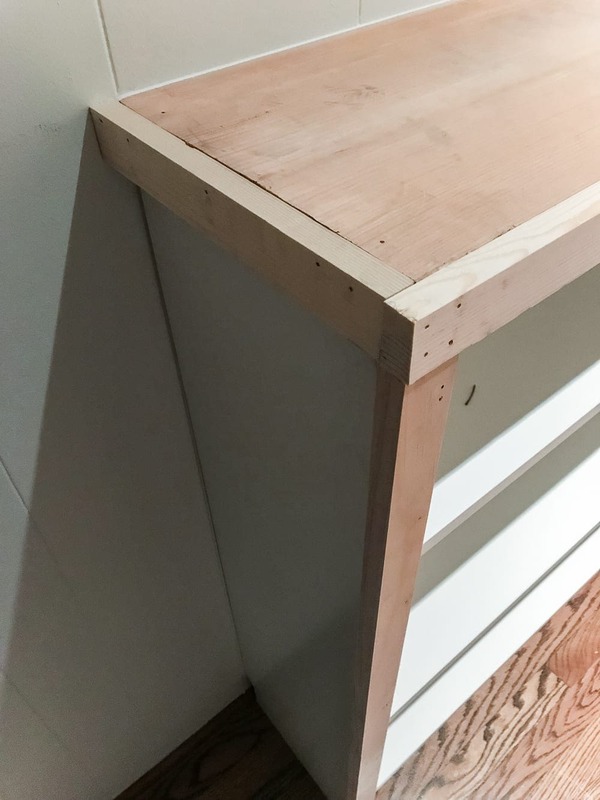 At this point, we also cut and nailed 1″x2″ boards to the fronts of the bookcases to hide the seams where we had screwed them together previously. 10. 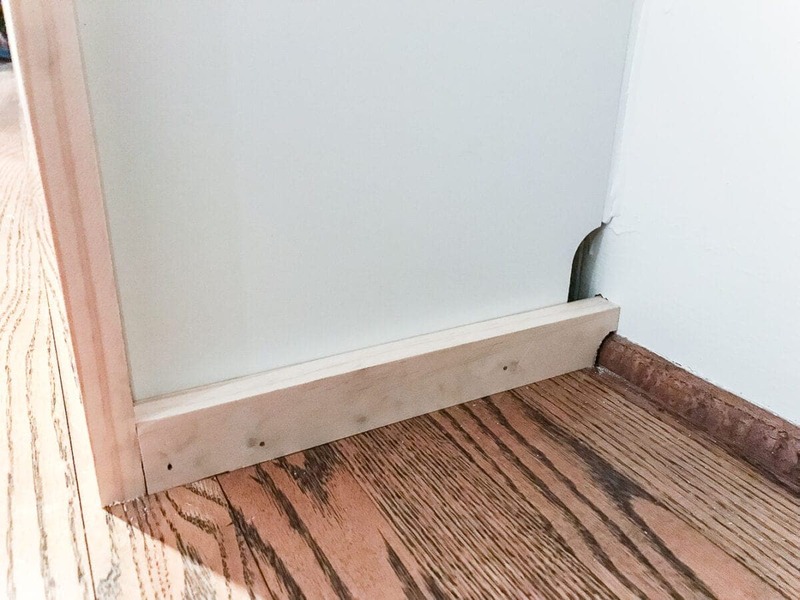 We decided to hide the gaps on the bookcases on the ends that were meant for a baseboard to run behind, so we cut another piece of 1″x2″ to fit between the wall and the 1″x2″ attached to the front. 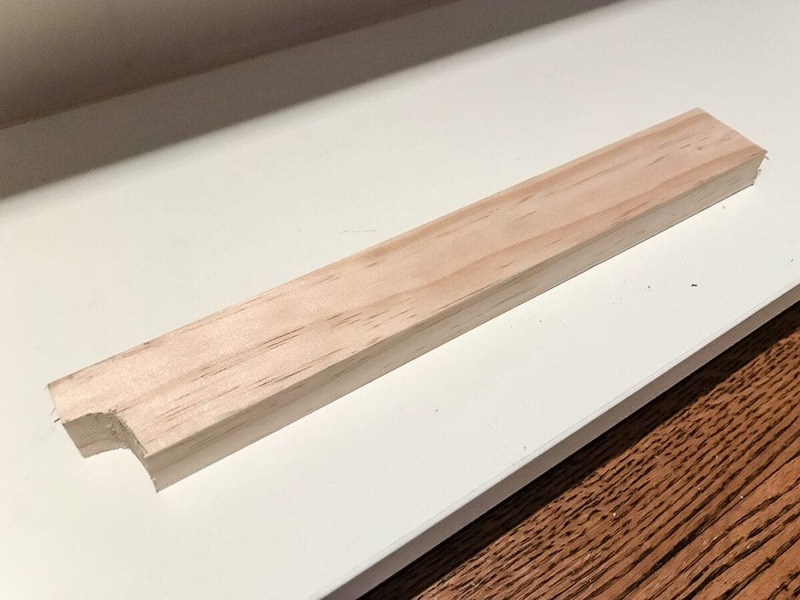 We notched out the piece with the jigsaw first so it would fit snug with our floor’s quarter round trim (since this room doesn’t actually have a baseboard). It doesn’t have to be exactly perfect. Caulk can go a long way. 11. 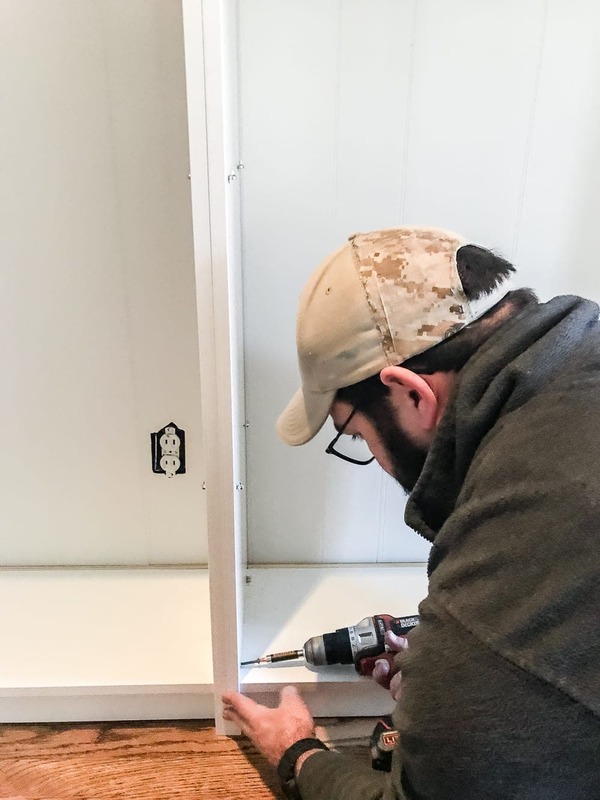 We wanted to finish off the side by creating a rectangular panel, so we cut one more 1″x2″ for each side to attach it with nails to the edge against the wall. 12. 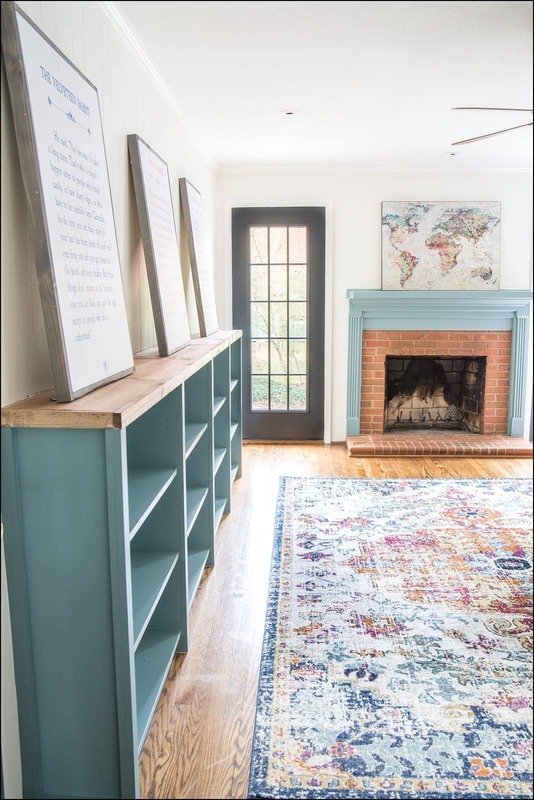 From there, we caulked every crack and cranny, let dry, stained the top with the Minwax Special Walnut to closely match our hardwood floors, sealed with Minwax Polycrylic, and primed and painted the bookcases with the Sherwin Williams Tree Swallow in satin. And now it’s ready for baskets so we can be organizing bandits! While I was painting the bookcases, I went ahead and painted the mantel on the fireplace the same color too. I’ll be changing the brick and cleaning out that firebox very soon. But with the French doors painted (thanks to a handy dandy trick I learned), the walls and trim freshened up, and this super functional built-in, we’re definitely going places. Tomorrow, we’ll be swapping out the old ceiling fan for a pendant light that will add even more playfulness to this space, and I think we’ve found a solution for the itty bitty barely functioning can lights too. 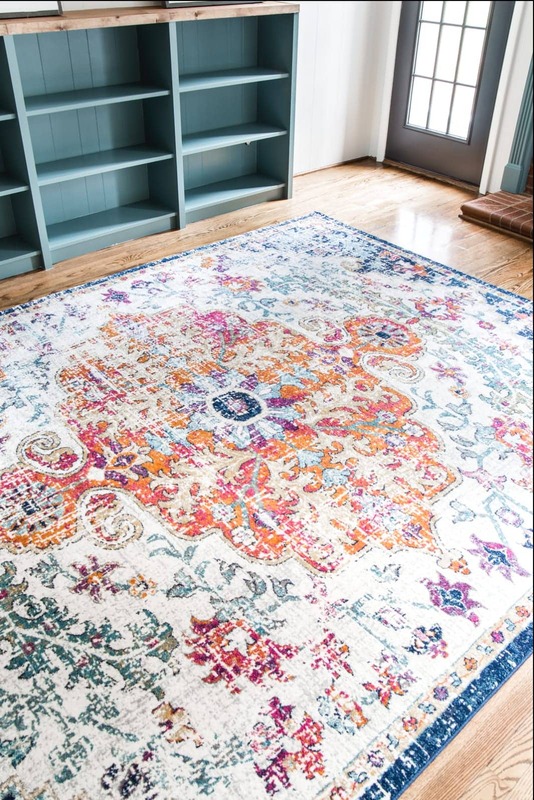 I found this super bright rug during a New Year’s sale a few weeks ago too, and it ties in so perfectly with the bookcase color and the colors of the DIY Storybook Art I’ve just leaned on the built-in top for now until we can hang them. For the rest of this week, we’ll still be doing touch ups, putting electrical plates on, anchoring the Narnia reading nook, and bringing in furniture until we can finally call this room finished! And then hopefully doing a massive toy purge before we pull all of those back in too. Limewash fireplace brick? Paint? Just clean it? Got any tried and true playroom organizational tips you’ve tried? I’ll take them all! Let me know in the comments. 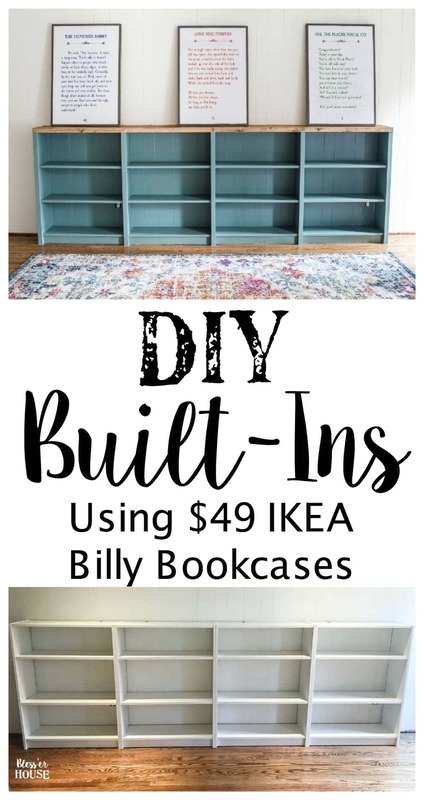 Did you do anything to prep the billy bookcases before painting? Did the paint adhere to the laminate fine? Looks beautiful! Yes, you can use Kilz Premium Primer to help it stick better. Lauren I love all these colors you are adding to the room. 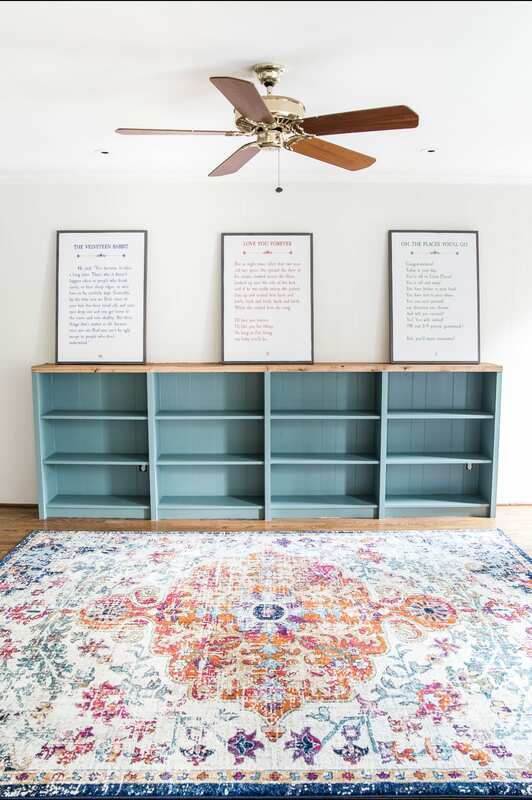 That bookcase is fantastic and the blue is heavenly. You know I was inspired by your post and went to get some Billy bookcases but with my luck, they were sold out. If must have been because of that winter sale. This room is coming together so beautifully! 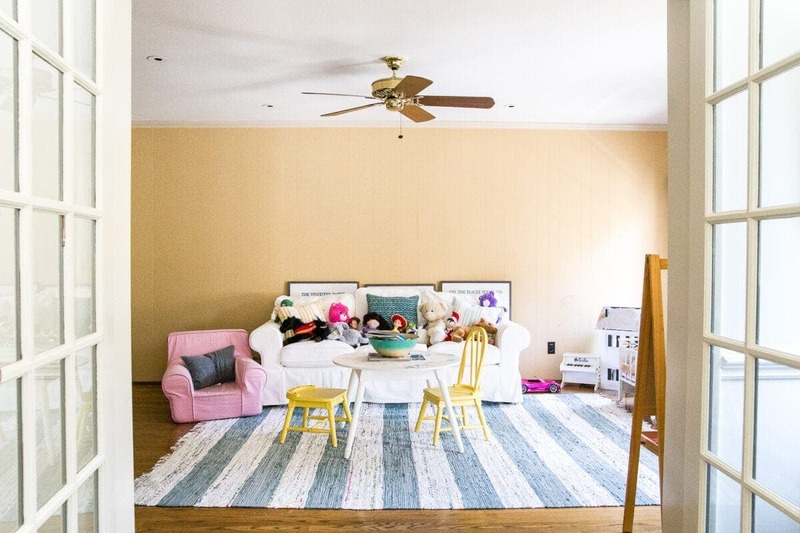 I gasped a little when I saw the first picture of the builtins with the rug. Thanks so much for sharing your ideas. You’re inspiring! You seem to do an awesome job at everything! I appreciate your very detailed instructions. One thing I’d like to have clarified – how does the top 1×12″ lay on top of the shelving with the anchors in place? 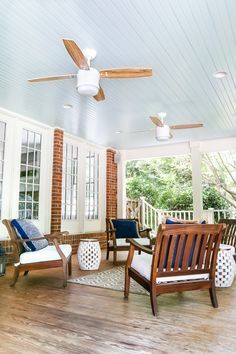 Would love to talk my hubby into a project like this! So the bookcases aren’t totally flat on the top. 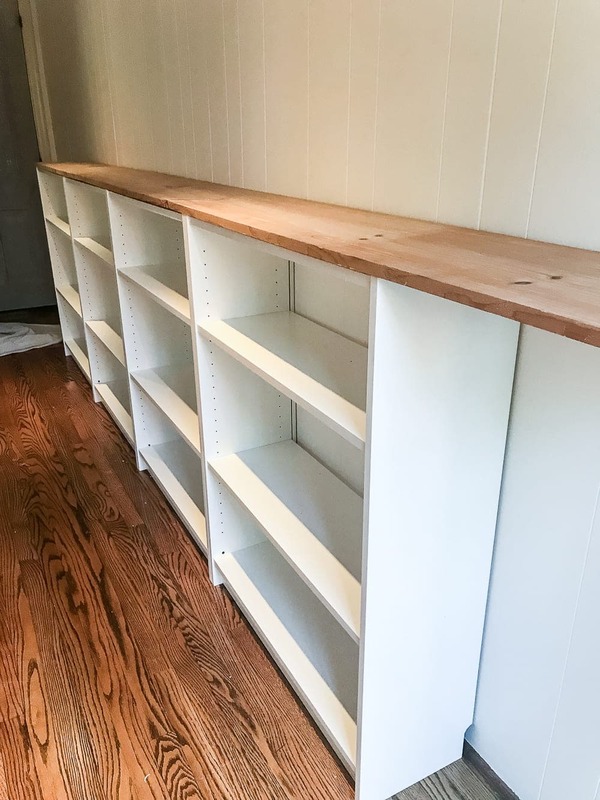 The ends of the bookcases come up just a few millimeters higher than the bookcase top piece, so that left just enough space for the anchors to sit between the bookcase top and the 1″x12″ board. Could I ask you where you got your rug. Love the colors you have chosen for this room. 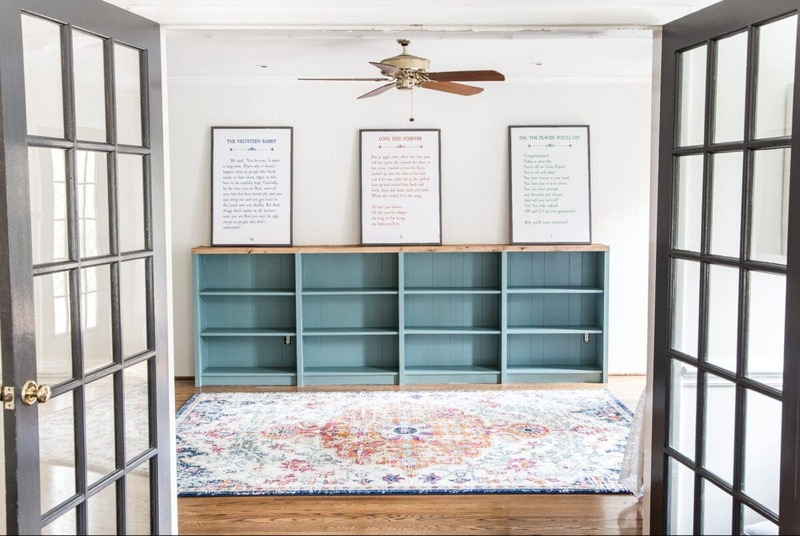 Great job on the bookcases and love the DIY Storybook Art. LOVE, LOVE, LOVE this…and everything you’ve done in your new home!! Thank you for all the amazing ideas, Lauren! You’re the BEST!! You may not realize it now, but that awesome playroom is an investment in the future. As Olivia grows up, the playroom will evolve and some day become a “hang-out” for Olivia and her middle school, then high school friends. They can have their “own space” in a safe and supportive home. When our son was going through high school, the finished room over our attached garage, complete with ping pong and pool tables and video games, became the place to be for he and his friends. They would still gather there during their breaks from college! They had their own space, but it also gave my husband and I a chance to talk with his friends, keep connected. Parental deliveries of snacks were always welcome and provided moments to check and connect! Believe me, you’re working on more than just a playroom! 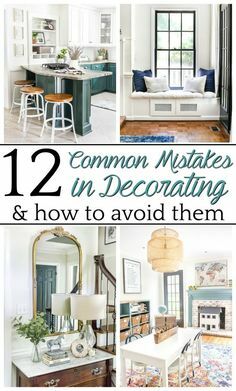 I don’t think there is anything you design/decorate that do not turn out fabulous. I simply love, love, love, love and love everything you do. Soooo what time will you be arriving at our home. Everything is gorgeous. stunning. I wish we could get IKEA here. You and your hubby did an amazing job. What a beautiful playroom! I really like the red-orange of the brick esp with the brightly colored rug in the room. I say clean it and live with it. It can always be painted etc later. Hi Lauren, I love the bookcases. The color is perfect! I want to get some of this color paint, but the Sherwin-Williams site doesn’t have a color called tree swallow. Help? Hi Tara! I found the color swatch at Lowe’s actually, but it’s made by Sherwin Williams. I don’t know if that makes a difference or not. But when I went to the Sherwin Williams store later to get my gallon of it, they were able to give me the color without a problem. Not sure why it’s not on their site, but apparently they knew what I was talking about when I asked for it in the store. Thanks, Lauren. I will go by the Sherwin-Williams store and see if they have it. I am loving all the projects you’ve been doing lately. By the way, I think we may live somewhat close to you. We are in Mooresville, NC. It looks amazing! I love that color blue you chose. Great job! I really love how these bookshelves turned out! May I give you a long-distance high-five from Texas?! 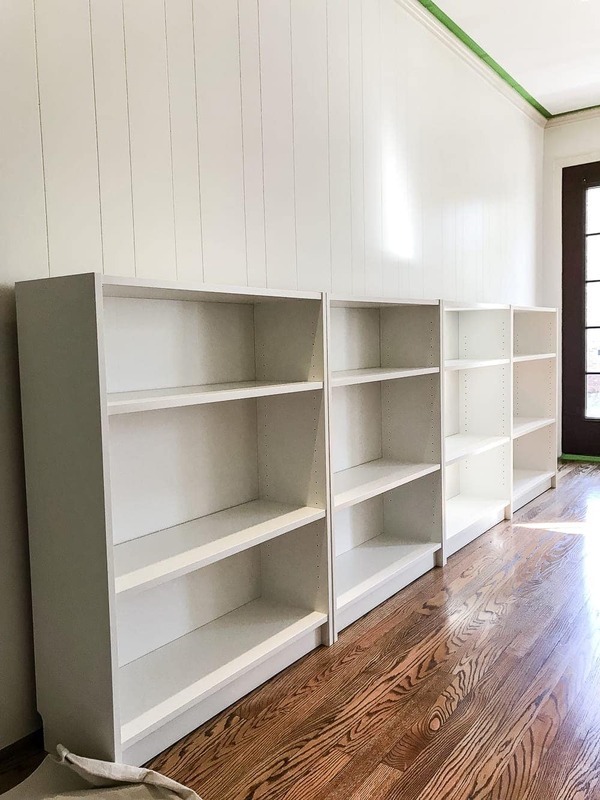 I am so happy to see how you bolted them to the wall so that the bookcases are super safe. I think that we are going to try this. Way to go! Gorgeous, gorgeous, Pinnable room! Everything is beautiful so far. I actually LOVE LOVE LOVE the natural RED brick on your fireplace with the “Tree Swallow” color mantle. It really adds a warmth to the room and coordinates well with the red/rusts in your rug and the wall art!! 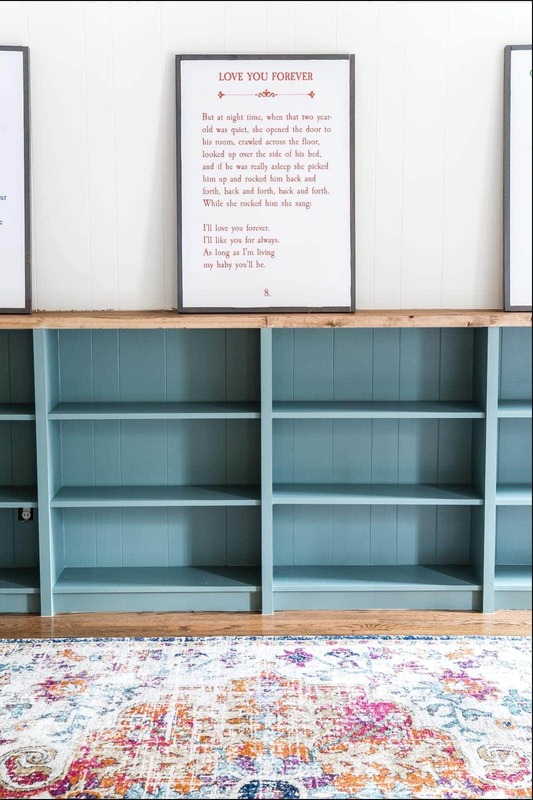 Great job on the bookcases and love the DIY Storybook Art. It is spacious and useful. Do you know if you IKEA sells door front that can install on these? They do! We used them on our taller built-ins in our old house. The doors are called Oxberg. Where did you find the baskets at? Thank you and I’m so excited to paint mine! I would definitely prime first. Zinsser 123 is my go to. 🙂 We’ve only had them a few months but so far so good! A couple scuffs here and there from our super active 5 year-old climbing all over them, but nothing major. 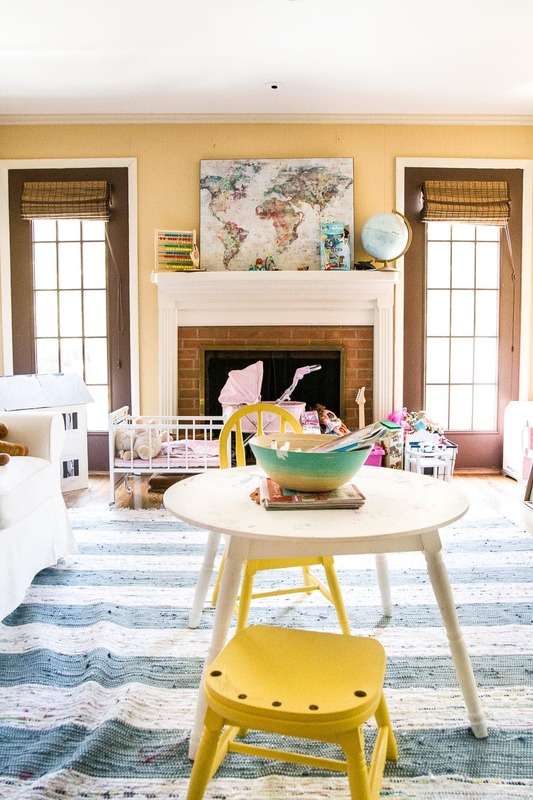 I love this playroom so much that I am using it as inspiration for my kids playroom! 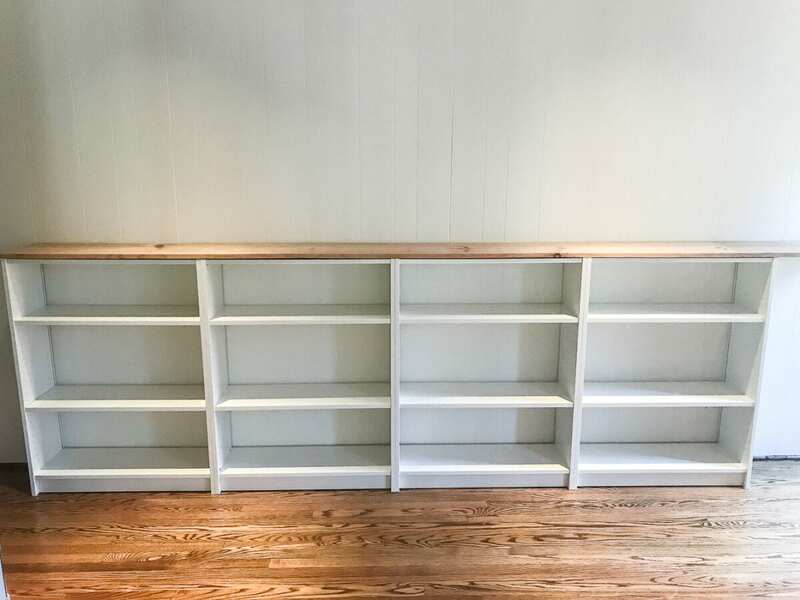 In doing so, I purchased only 3 of the billy bookshelves, but I keep wondering how you got those baskets to fit on the shelves without hanging off? According to the dimensions online they wouldn’t fit on the shelf. I just purchased baskets different but almost the same exact size of yours and they hung over so bad! Just looking for your advice since you did such a wonderful job! Hi, Ashley. 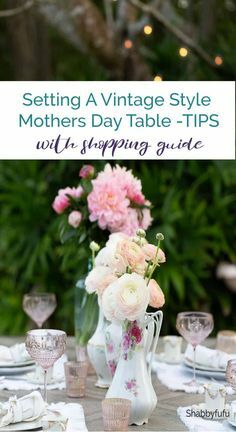 The baskets we used are here https://rstyle.me/n/c6hm72b5ky7 and are as pictured on the blog. They should not stick out from the shelf. I hope this helps get you the baskets you need.